In addition to the creation of a website, the National Collection of Children's Books project had a number of other outputs, including a public exhibition, a symposium, and an edited volume of academic essays. Further details below. The National Collection of Children's Books exhibition was entitled 'Come Closer: The Darker Side of Children's Books' and ran at Dublin City Library and Archive, Pearse Street, from 28 September to 14 November 2015. Children's literature became a well-established category of its own in the 18 th century. Today, the term is used to refer to a wide range of forms and genres: picturebooks, illustrated texts, novels, poems, Young Adult fiction, folktales, fantasy, school stories, and so on. For hundreds of years, many of the books written for children have dealt with complex and seemingly dark themes, yet the popular myth persists that such themes cannot be found in children's literature, or that they are somehow inappropriate topics for child readers. The exhibition offered a glimpse into some of the sophisticated and complex ways in which writers and illustrators of children's texts have engaged with controversial subjects. The exhibition was launched on 28 September by Timothy Young (Yale University). He delivered a lecture entitled 'Happy Deaths and Urban Dangers: The Darker Side of Children's Literature'. Young is curator of the Betsy Beinecke Shirley Collection of American Children's Literature, housed at the Beinecke Rare Book and Manuscript Library of Yale University. 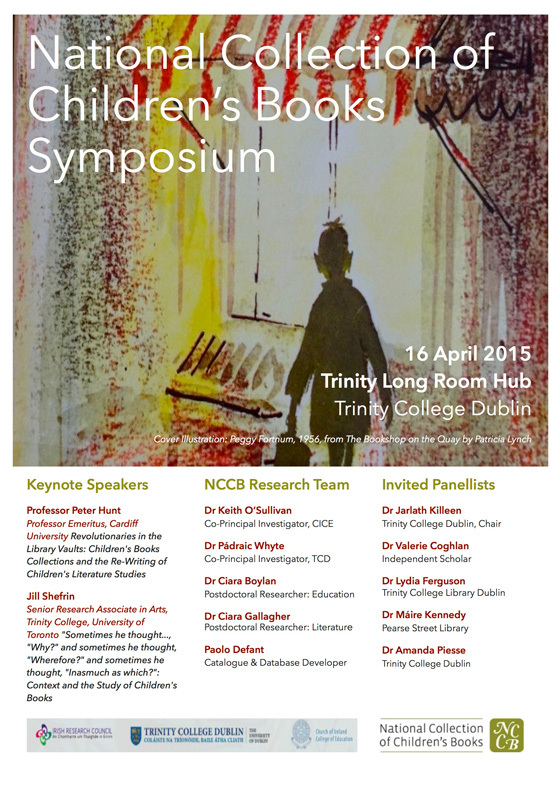 In April 2015, the NCCB team held a symposium at Trinity Long Room Hub featuring keynote lectures, a panel discussion and presentations from the NCCB team. Dr Jarlath Killeen (Trinity College Dublin), Dr Valerie Coghlan (Independent Scholar), Dr Lydia Ferguson (Trinity College Library Dublin), Dr Máire Kennedy (Dublin City Library and Archive, Pearse Street), and Dr Amanda Piesse (Trinity College Dublin). Treating children's literature collections as artefacts of knowledge and heritage, as well as architecture for new scholarship and discovery, this volume explores the varying ways in which children's books – from collections in one city – are literary, cultural, national and international resources, as well as catalysts for contemporary commentary, revision and change. From the individuals and institutions that create and hold them to the researchers and public for whom they have been designated as valuable, children's literature collections occupy significant and interesting liminal spaces: between 'private' and 'public', 'national' and 'international', 'instruction' and knowledge', 'history' and 'possibility', and 'archaeology' and 'architecture'. Engaging with a UNESCO City of Literature – Dublin – as a case study, this will be the first substantial academic volume to bring collections out of the dark of children's literature scholarship – and, indeed, literary scholarship more generally.